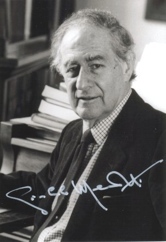 I was just talking in December about the fact that Gian-Carlo Menotti was still alive, and sadly, he died today. Sigh. I’ve got an opera of his on my wish list on Amazon. It’s called The Medium. From the Times, today: “The Medium, written in 1946, ran for 211 performances on Broadway the next year with another Menotti piece, The Telephone. The Medium was a compendium of the Menotti style — delicate orchestration, lyric writing and often a melodramatic theatricality. Menotti was 95. I quoted Upton Sinclair’s wife in my book yesterday. It was something she said at the end of her life. “I look out across the world and it is peopled with strangers!” I was thinking, I wonder if Menotti had thoughts like this. But maybe not. He knew so many people. And he loved children. Maybe his world wasn’t filled with strangers at the end, but lots of friends.